In this lesson, we will learn how to estimate the square root value of a nonperfect square number. Identify which of the arrows represents the position of √ 3 0 . Which of the following is an irrational number that lies between 2 and 3? Identify which of the arrows represents the position of √ 9 0 . Identify which of the arrows represents the position of √ 5 1 . 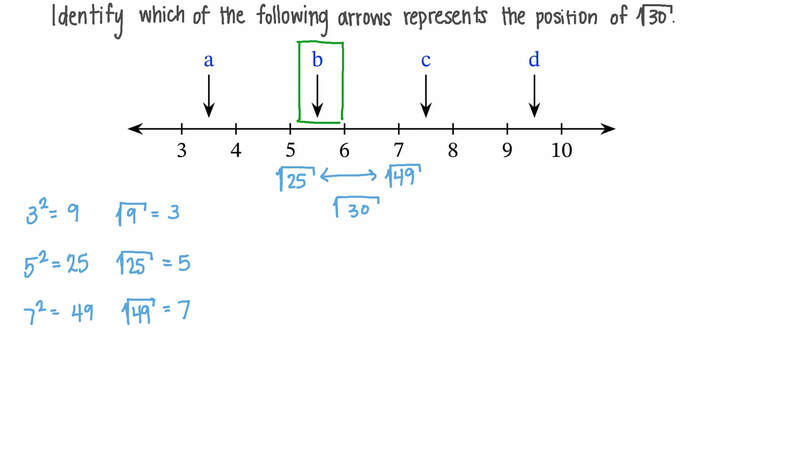 Identify which arrow represents the position of √ 1 7 on the number line. Identify which arrow represents the position of √ 2 4 on the number line. Find the two consecutive integers that √ 5 5 lies between. A If you evaluate √ 1 7 , the answer is between 4 and 4.5. B If you evaluate √ 1 7 , the answer is between 5 and 5.5. C If you evaluate √ 1 7 , the answer is between 4.5 and 5. D If you evaluate √ 1 7 , the answer is between 3 and 3.5. E If you evaluate √ 1 7 , the answer is between 3.5 and 4. Is 8 + √ 3 2 greater than, equal to, or less than √ 4 0 ? Identify which of the arrows represents the position of √ 1 3 . 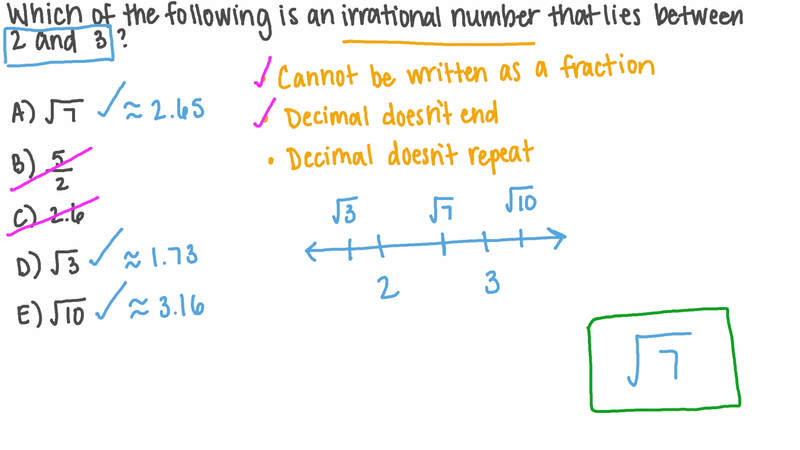 Which of the following is an irrational number that lies between 6 and 7? Is 1 1 + √ 9 1 greater than, equal to, or less than √ 1 0 2 ? Is 5 + √ 6 2 greater than, equal to, or less than √ 6 7 ? Find the two consecutive integers that √ 1 2 8 lies between. Find the two consecutive integers that √ 6 6 lies between.